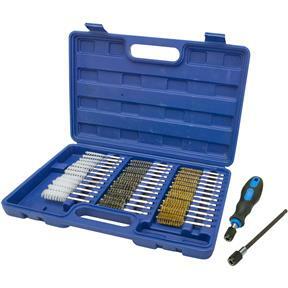 Wire Brush Set 5/16"-3/4", 38 pcs. Grizzly T26721 - Wire Brush Set 5/16"-3/4", 38 pcs. This handy Wire Brush Set includes 12 stainless steel, 12 brass, and 12 nylon brushes, each one with a quick-release 1/4" hex shank. Diameter sizes range from 5/16" to 3/4" so you can find just the brush you need for the job, such as cleaning bushings, engine ports, tubing, channels, sockets, and more. 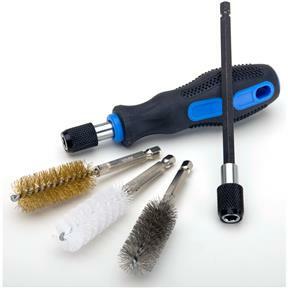 Comes complete with a quick-release handle, 6" extension, and a protective blow-molded case.